Carebag Bedpan Liner Fits Oval Bedpan are award-winning CareBag bedpan liners that seamlessly convert liquids into gel within a matter of seconds. While other, less advanced bedpan liners lack the technology to reduce the spread of germs, these patented CareBag bedpan liners are specifically designed to prevent the spread of hidden pathogens and bacteria, thus decreasing the risk of hospital-acquired infections. Bedpan Liner Fits Oval Bedpan fits most sizes of bedpans and completely eradicates unpleasant odors when closed, creating a hygienic user experience that is both discreet and comfortable. 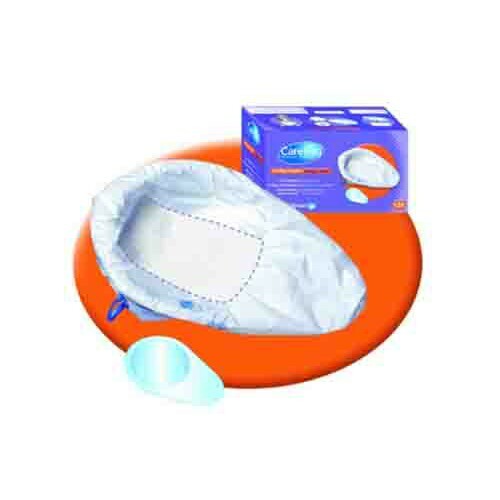 You may also be interested in similar bedpans and bedpan products, such as the Flushable Bedpan Cover. Award-winning bedpan liner that fits all bedpan sizes and shapes. Single use liners that transform liquids into gel within a matter of seconds. Minimizes patient exposure to body fluids, thus reducing patient exposure to hospital-acquired infections. Complete eradication of unpleasant odors when closed, creating a discreet and user-friendly experience. Dimensions: 23.6 Inches x 15.8 Inches. WHICH IS IT? Commode Liner Fits Round Pail OR Carebag Bedpan Liner Fits Oval Bedpan ? Can't you fix your listing? We've adjusted the description to read "Fits Oval Pail." Thank you for bringing that to our attention. item #C7831738 "Commode Liner Fits Round Pail" and "Fits Round Pail" also says "Carebag Bedpan Liner Fits Oval Bedpan". Which is correct for this item number? We've adjusted the description to read "Fits Oval Pail." We apologize for the inconvenience.